Survey June 2016 : 1 in 3 Americans Have Less Than $500 in Savings to cover Emergencies! Everybody knows that savings are the backbone of financial security and allow us to support ourselves during emergencies. Yet new data suggests people across the world are finding it increasingly difficult to put a substantial amount of money away, leaving them at risk of falling in to debt and other financial problems. Bargain Fox recently asked 3560 people how much money they have in their savings account or emergency fund, and 1 in 3 Americans said they had less than $500, while 1 in 3 Brits had less than £100 (comparatively even less). "This might be enough to buffer a few unexpected bills," says Bargain Fox's Harsha Kiran, "but anything more catastrophic would result in immediate debt or a budget that would leave them with little to no disposable income." 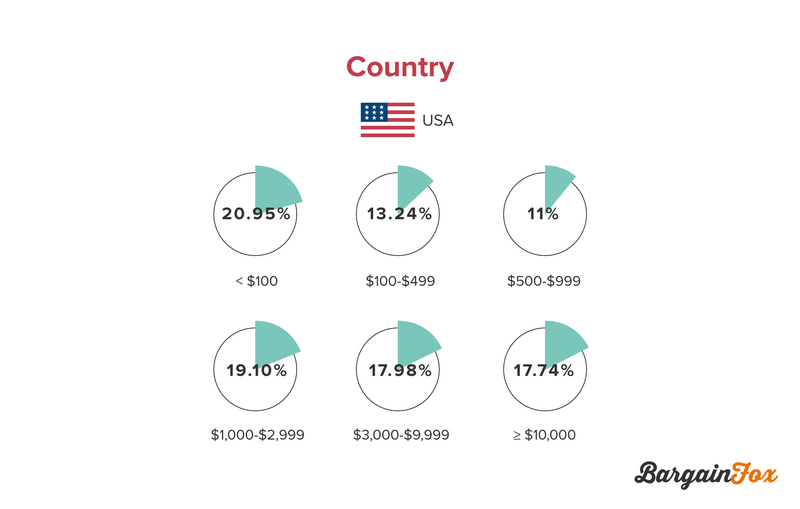 1 in 5 Americans have less than $100 in savings, while 45% have less than $1,000. Only 35.7% of Americans have more than $3,000 in savings. 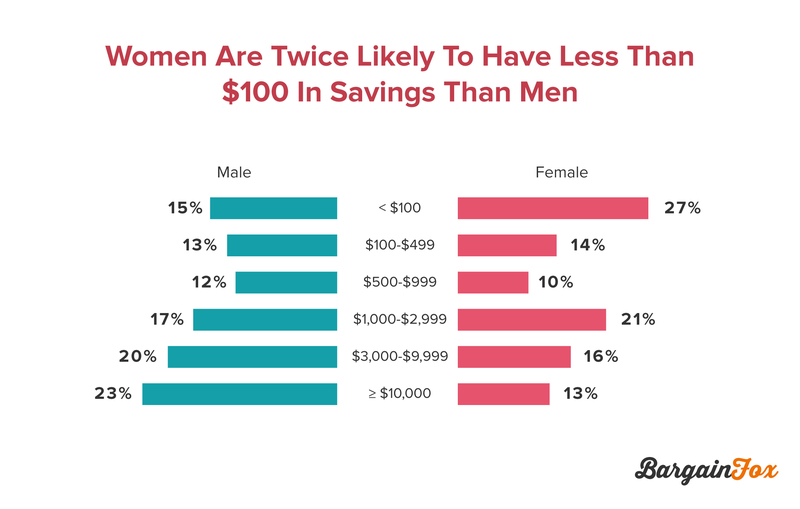 Women are nearly twice as likely to have less that $100 in savings than men. Men a twice as likely to have more than $10,000 in savings than women. Millennials have less overall savings than Generation X and the Baby Boomers. 11.33% of Millennials have over $10,000 in savings, compared to 25% of Generation X and 27% of Baby Boomers. Half of those with a PHD have $10,000 or more in savings. 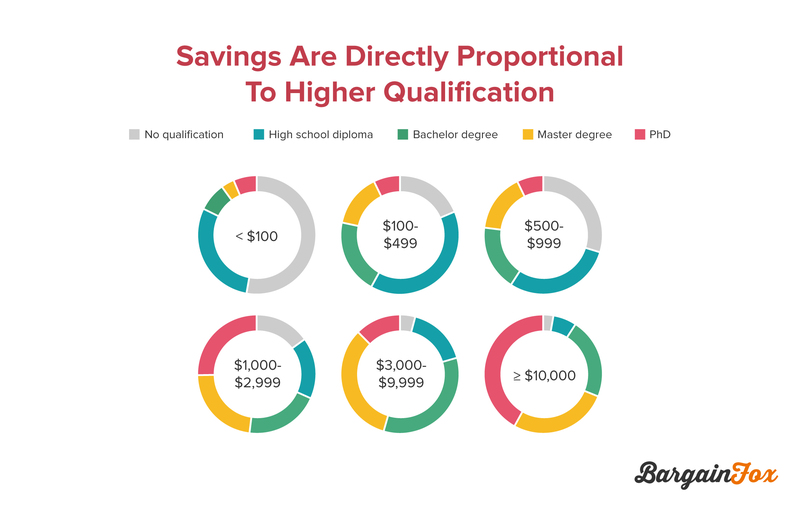 Over half of those who do not have any qualifications have less that $100 in savings. The higher the qualification the more people save on average. Half of households that have an income of over $100,000, have more than $10,000 in savings. 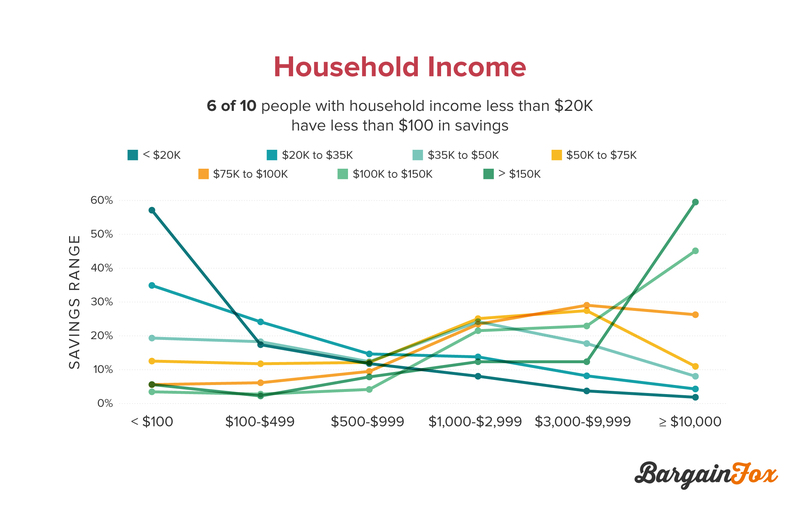 Half of households with an income of less than $20,000, have less than $100 in savings. How much money they have in their savings account or emergency fund? Furthermore only 35.72% of Americans had more than $3,000 saved, and only 24.8% of Brits had more than £3,000. That might be enough to buy an old used car or go on holiday, but does it provide a secure future? It's not very encouraging that in two of the supposed most prosperous countries in the world, the average person has so little to support themselves in emergencies. Has everyone turned to credit cards and loans? Are they dipping in to their home equity or retirement funds to prevent unforeseen financial calamities? The survey shows that overall 45% of Americans have less than $1,000 saved, and 20.95% have less than $100. Likewise 45% of Brits have less than £500, while 32.98% have less than £100. The lowest amount (less than $100 and £100) was the most chosen answer respectively! Whether it's poor planning, low income or something else, there's a clear dividing line between the non-savers and savers, and everyone is saving less across the board. In the US the average personal savings rate has been declining since the 70s, when it was as high as 17% of personal net disposable income. In March this year this was just 5.4%. 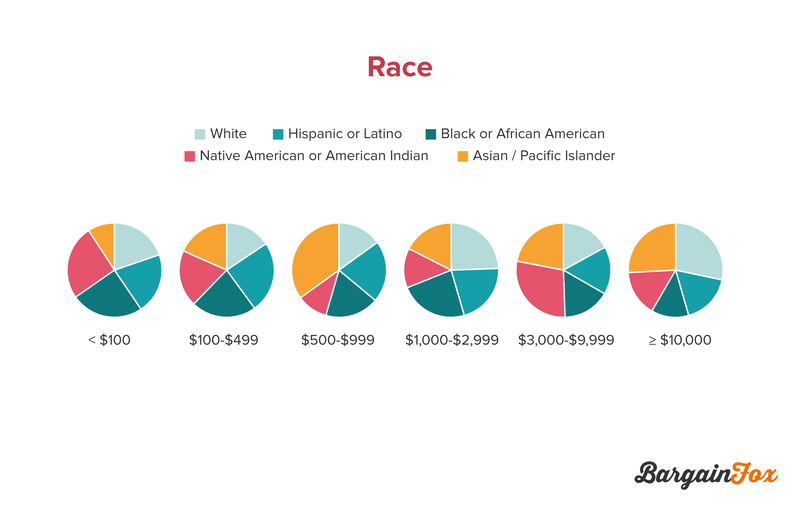 Let's take a closer look a how all of this is reflected in the demographics. Overall, women are twice as likely as men to have less than $100 in savings - some 26.72% compared to 14.72% of men. 40% of women have less than $500, compared to 27% of men. And men are twice as likely to have more than $10,000 in the bank than women. "Whether this is reflective of a gender pay gap, differences in the industries that men and women enter and how much they pay, or the fact that on average men work more hours than women over their career - it's apparent that women have much less financial security," says Kiran. This suggests that in a relationship or marriage situation women are still more likely to rely on the man in a financial emergency. 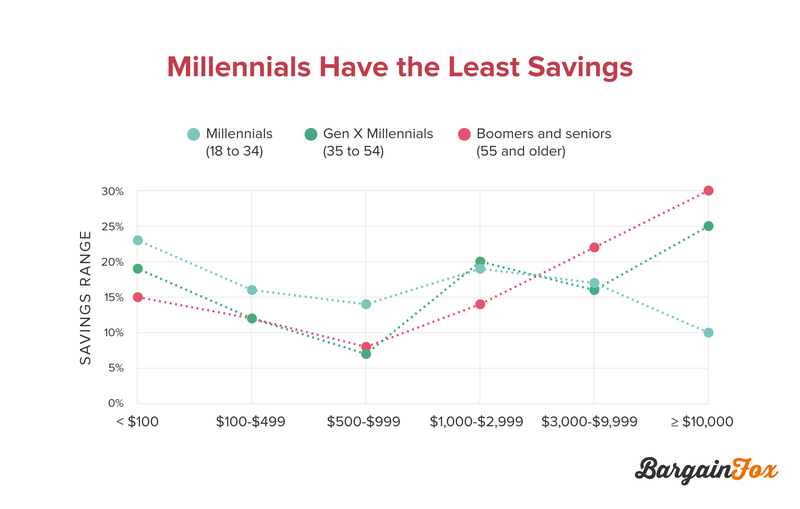 In terms of age Bargain Fox discovered that Baby Boomers and Generation X tend to save more than the Millennials, 37.82% of which have less than $500 in savings. 50.99% have less than $1,000. Whereas 30.76% of GenX have less than $500 and 37.9% have less than $1,000. The oldest generation (the Boomers) have saved the most, with 28% of those asked having less than $500 in the bank. Those that do have a nest egg of over $10,000, includes 27% of Boomers, 25% of GenX, and just 11.33% of Millennials. This result was perhaps easier to predict. After all, the longer you have been alive the more time you've had to amass those savings and the more likely you are to have advanced up the pay scale. In future studies it would be interesting to see the contrast between millennials, generation X and baby boomer savings, when they were all the same age. It's now accepted that today's young people face a tougher economy than their parents. However it's also possible that their parents come from a culture of saving that no longer exists. Although as the years go on more people are questioning their qualifications and the educational debt they can bring, as it currently stands those with higher qualifications still clearly have the most amount of savings and are therefore financially better off. For example 50% of those who have a PHD have more than $10,000 in savings, while only 17% have less than $100. On the other side 55% of unqualified people surveyed have less than $100 to their name. It also stands to reason that those who earn more are able to save more, even if the percentage of income saved is different. 57% of households on an income less than $20,000 have no more than $100 in reserve. 85% of 20k or less households have less than $1,000. 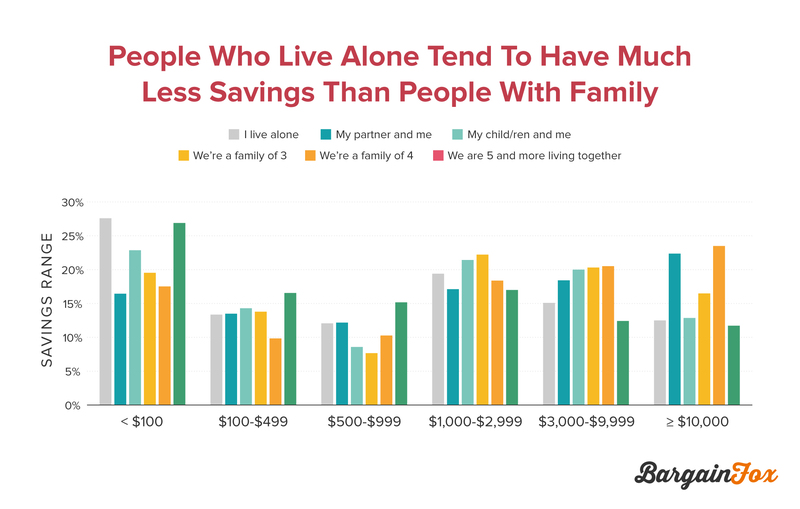 One the other hand 68% of those with a household income between $100,000 and 150,000, have more than $3,000 saved, 60% have more than $10,000, and 90% have at least more than $1,000. They are far better prepared for a financial emergency. It's clear by the data that if you're an under-qualified young person, with a low household income (particularly a woman), that large savings are just not going to happen. Even if you do live in the United States, the so called 'richest nation on earth.'" "The worrisome thing is that those who find themselves in this kind of situation are the most prone to financial emergencies, and are therefore the most in need of an emergency fund," says Kiran. "If you're one of those 45% of Americans that have less than $1,000 in savings, it's always going to be tough to put more aside, but that's precisely why a solid plan need to be put in place." Experts suggest that putting a small percentage of your income aside every month can become second nature, and you won't even miss it if you arrange an automatic transfer in to a second account. An extensive survey was conducted by Bargainfox and powered by Survey Firm QuestionPro in May 2016 2016. Bargainfox survey compares and contrasts generational preferences of 3560 people in which 1240 are from USA, 1210 from UK and 1110 from india. Respondents received emails inviting them to participate in an anonymous online survey. They were not given an information that the survey was being conducted on behalf of Bargainfox. A total of 2,009 participants from the US completed the survey.